Genuine cork from Portugal's famous cork trees give wine organization a purist look. Write the year, varietal, region, or any other descriptor for your wine directly on the tag, cut to fit over standard and large-size bottlenecks. Paper-backed. Made with renewable cork. For collecting, it's the natural choice. Genuine cork from Portugal's famous cork trees give wine organization a purist look. Write the year, varietal, region, or any other descriptor for your wine directly on the tag, cut to fit over standard and large-size bottlenecks. Paper-backed. Made with renewable cork. BEST ANSWER: Thank you for your question. These tags are 3-1/2" in height, 2-1/8" in width on the bottom, and 1-1/2"W on the top. 3.25h x 2.125w (inches). The "Wood Tone" tags are the same size. How many of these are in the package? BEST ANSWER: Thank you for your inquiry. There are 24 bottle tags per package. Thank you again. BEST ANSWER: Only if you write with an erasable marker. These are really good looking but I find it difficult if not impossible to write on. 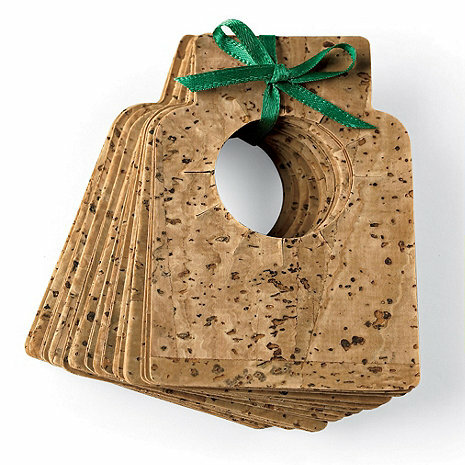 It is real cork complete with little nooks and crannies but… try writing something on them. What you get is a scribble that IMO looks terrible and really not acceptable. I recommend buying the "wood tone bottle tags". They aren't as good looking but, unlike the real cork tags, you can write on it legibly. And from five feet away it is difficult to see much difference in the tags. The one problem with the wood-tone tags is that they have the "WineEnthusiast" logo plastered on them. Other than that they are great! Maybe instead of the WE logo on the tag they could be personalized. After using these tags, I ordered more of them. I have replaced all of my old white & colored tags with these. My cellar now looks beautiful! I love the product.....but, I will not order again because of the waste of material in overshipping. The three tags were sent in a 12x12 inch by 6 inch tall box stuffed full of paper and at the bottom 3 little wine tag packages. These tags could have been sent in a padded envelope for 1/2 the price and arrive in my mailbox. What a waste...I was really taken back by the lack of judgement for shipping the product. Great for searching quickly for a certain bottle.